The rich colors and bold design of this necklace are guaranteed to turn heads wherever you go. This one-of-a-kind accessory is packed with interesting and organic elements and you'll discover something new every time you wear it! 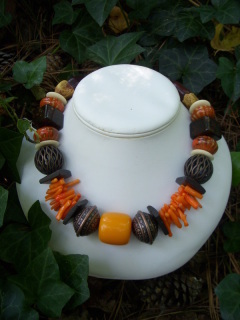 A chunky necklace, components range in size from 20 to 32mm. Predominant colors are orange, mustard, brown and copper. Materials: Coral sticks, tortoise squares, nuts, bone, porcelain rounds, brass/copper/metal acccents, and wood.